For those of us familiar with the offerings around The Valley, it is common knowledge that there is very little to be excited about when it comes to dining in Mesa. There aren’t a lot of offerings and the places that stand out tend to close early. 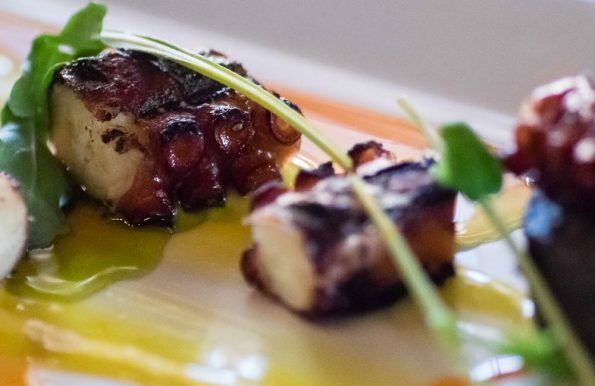 Well lucky for you, we’ve found the hidden gem of Mesa, D’Vine Bistro! 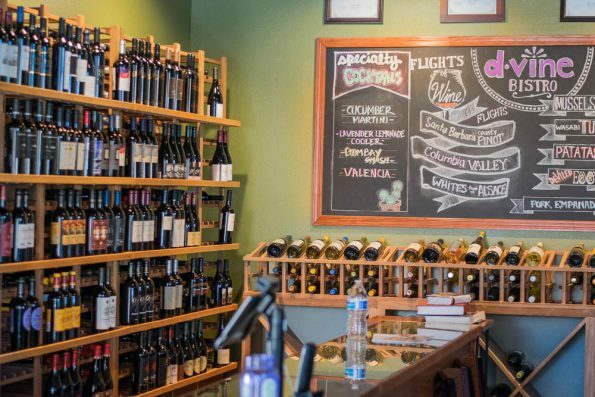 D’Vine has been an East Valley staple for 12 years. They have 2 locations, one in East Mesa (the one we dined at) and one in Chandler. This write up will focus on the Mesa location helmed by Executive Chef Ramon Rice. When we asked Ramon about the inspiration behind his menu, the answer was clear, “fine dining that is accessible.” This is right in our wheel house. Fine dining doesn’t have to feel pretentious or cause alarm. At D’Vine Bistro you can get a fantastic meal that is clearly above par yet feel comfortable in the environment in which you are eating. 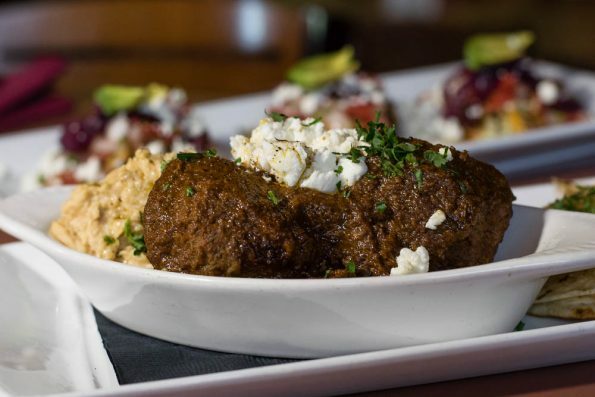 Moroccan Meatballs (house made meatballs sauteed in a spiced tomato sauce with goat cheese, hummus, and grilled house made flatbread topped with zatar infused oil and fresh parsley)– These meatballs were one of our favorite menu items of the day. They are so juicy and packed full of flavor. The flatbread is also equally as good and doesn’t feel like an after thought. Though listed on the appetizer section of the menu, they can easily make a meal. Deviled Eggs (house made deviled eggs with red chile jam and fresh jalapenos)– We love deviled eggs! Seriously, even after making 5 dozen we aren’t sick of them! The deviled eggs at D’Vine are only on the Happy Hour menu, so get them while you can! They are just how we like them, with the mustard more prominent. Street Tacos (3 mini corn tortillas topped with ancho sauteed beef, habanero vinaigrette, tomatillo green chili aioli, pickled red onion, avocado, cotija cheese, and pico de gallo)– Of course tacos had to be on this list. Fortunately, they aren’t here for the sake of being here. They were AUH-MAZ-ING! Loaded with flavor and just the right amount of heat, you can bet we’ll be heading back for Taco Tuesday! Salmon (grilled served over sweet pea risotto with mint and bacon, topped with arugula pesto and cherry tomatoes)– By the time we got to entrees we were so stuffed that we thought we couldn’t eat another bite. This salmon however, changed that. Grilled to a perfect medium rare, it was delightful on its own. The sweet pea risotto just added an additional level of deliciousness. In addition to the large selection of wine offered, D’Vine Bistro also has a good selection of craft cocktails. We tried a few of the listed cocktails but as with food, one of the highlights of D’Vine was the Cocktail DuJour offered by bartender Taylor. The day we were in, the cocktail was a Manly Sangria. Based on a Negroni, Taylor replaced the sweet vermouth with Malbec. This created a very different but delicious cocktail. D’Vine Bistro is truly the hidden gem of Mesa. How we waited so long to dine there we will never know. You can be sure however, that we will be back! Be sure to follow them on Facebook for wine tasting events and more! What are some of your favorite Mesa dining spots? We’d love to hear all about them! Leave a comment below or use the hash tag #GeekEats!